Desertification is not a word that many people outside of the scientific community have heard. But in February of this year, a soft-spoken 77-year-old gentleman named Allan Savory walked out on the TED stage in Long Beach, California, and defined it for the audience: “Desertification is a fancy word for land that is turning to desert.” He showed pictures of grasslands that slowly but surely become very dry and eventually waste away altogether, leaving the ground bare. It is a worldwide problem. While here and there scientists might disagree with Savory and his work, none would likely argue with the fact that half to two-thirds of the open land on Earth is undergoing this process. Savory then told the crowd, “I have for you a very simple message that offers more hope than you can imagine.” He proceeded to calmly present the results of his research, documented with images of that same type of land transformed back into lush, green grasslands. When he reached the end of his presentation, the awed audience responded with a standing ovation. Since that time, news of Savory and his accomplishments has been spreading steadily throughout the world, and he has been invited to visit country after country. While most of us are just now hearing of him, Savory’s methods have not been arrived upon overnight by any stretch. His journey has been fraught with decades of frustration and even acute tragedy. But he is now finally getting the word out: over two million viewers have seen that 22-minute presentation, and Savory’s assistance is being requested in many corners of the globe. We caught him just before he left on a trip to Australia, from whence he would be going back to his native Zimbabwe, then on to the UK. 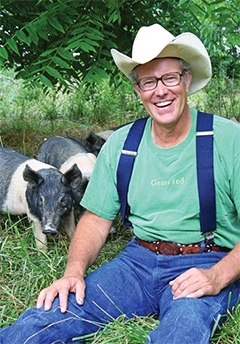 Click here to read what Joel Salatin has to say about about Allan Savory and his work. Savory explained in his TED talk that a bare patch of ground is much colder at dawn and much hotter at midday than if it’s covered with plant matter. Hence the microclimate of the area has been changed. But when this is occurring on over half of the world’s land, it is affecting the macroclimate. Concern with this issue originated for Savory all the way back in the 1950s, when he embarked on his career in what was then the country of Rhodesia. “I began as a wildlife biologist, recognizing that habitat destruction was more dangerous to wildlife than poaching,” said Savory. 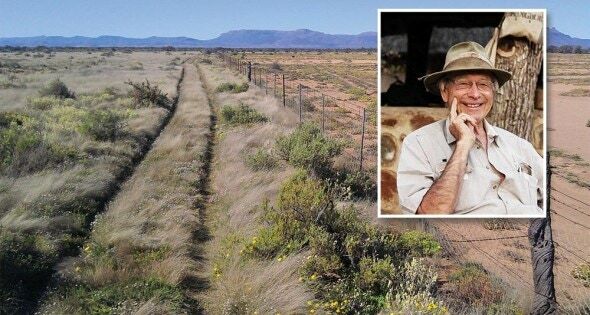 He became part of a project setting aside lands for national parks, and following the age-old belief that livestock grazing was the cause of destruction of grasslands, he made sure that the land he was setting aside would be untouched by livestock. To his great surprise, Savory found that the lands so isolated deteriorated rather than improved; the desertification process increased. Conducting further research, he concluded that wild elephants were to blame and recommended their numbers be reduced. Very unfortunately, a team of government experts agreed with his findings, resulting over the following decades in the killing of some 40,000 elephants. When in 1979 Savory came to the US, he was to discover that desertification was not at all a problem peculiar to his native continent. “I found national parks with no livestock, no big game, nothing—just totally rested land where the government had spent millions of dollars on planting grass and other soil conservation measures,” he recalled. “I found them to be just deep arroyos and gullies, and worse desertification than I was dealing with in most of the areas in Africa. That investigation carried forward into the mid-2000s, when Savory finally discovered the ideal balance. As he explained to the TED attendees, “What we had failed to understand was that in these seasonal humidity environments of the world, the soil and the vegetation developed with very large numbers of grazing animals, and that these grazing animals developed with ferocious pack-hunting predators. Now, the main defense against pack-hunting predators is to get into herds; and the larger the herd, the safer the individuals. While Savory certainly saw results, they weren’t of a consistent level. He then decided to exactly mimic his original observation. “Now take that same land, and those ten paddocks are not fenced; they are just roads, elephant paths, rivers—anything that the herders can see on the ground and recognize as divisions. So, our land in Africa is divided into about ten paddocks, but there’s not a single fence. We do exactly the same planning and plan the moves of the animals; however, when they are in one of these areas now for, say, twenty days, following which the area will have perhaps two months of recovery time, they are herded, and the herders are trained to not have the animals graze and trample any part within the paddock for more than three days. In this manner, day or night, 500 cattle are on less than two acres. They’re bunched the whole time as they would be if they feared predation. “That made a world of difference. We literally ran out of bare ground even for teaching purposes—we have to hunt for it now. This year we’re in what would have been a catastrophic year, drier than we have seen for 15 years, and we’ve grown more grass, shrubs and trees than we did in the best of years in the past. At the TED conference, Savory showed how this process of holistic planned grazing, using livestock to mimic nature, is being employed to revive farmland in Africa. Livestock are being moved over land that will later be used to grow crops, and as a result they have seen a marked increase in crop yields. This leads to applications across the agricultural spectrum, which of course includes the raising of livestock as well—an activity that takes the majority of agricultural land use. Meanwhile Savory is also addressing the desertification problem on the policy stage, where it is an issue that crosses boundaries in isolated areas of expertise, policy and research. “It’s really an enormous problem and we’ve always fractured it,” Savory said. “You have whole environmental organizations, departments in universities, and conferences built around biodiversity loss. Then you have entire conferences and the range profession dealing with grasslands of the world that are desertifying; plus you have separate scientists and conferences dealing with climate change. Rather than tackling the problem with enormous governments such as the US or the EU, Savory is utilizing a smaller country to demonstrate how it can be cooperatively solved. “To change the United States’ direction is like trying to turn an aircraft carrier with a paddle in your hand,” he said. “But taking a small country in trouble, we might be able to do something. I’m focusing a lot on my own country, where I spend about six months of every year. Recently I got a chance to put 35 members of parliament lawmakers through a workshop using the holistic framework to formulate policies. Savory has a dedicated, competent team in place to help him carry on his work, in the form of the Savory Institute of Boulder, Colorado. “It is this vibrant organization of deeply committed people and its global strategy of learning hubs that will carry the baton,” he said.